Over 15 Years experience with managed IT services, Small Business IT Consulting Services, technical support to strategic consulting. 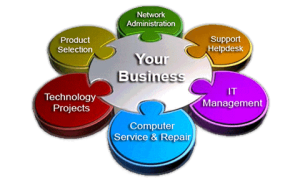 We have the IT solutions for your growing business. Whether you have an immediate short-term technical project or are looking for a long-term trusted IT partner we are your answer, let us be your IT consulting firm. We are proud to support businesses throughout Downtown Toronto, Scarborough, and the rest of the GTA. With our Remote monitoring services and management tools we will maintain a healthy infrastructure for all our clients. Managed IT Services is an innovative approach of providing Business IT Support where an IT Service Provider proactively monitors and resolves issues with the client network, servers, desktops, and all networked IT Infrastructure. Traditional IT Support, also referred to as “break-fix” was a reactive approach to solving IT problems that a business faced. When something stopped working, support would be called upon to investigate the cause and fix it. This led to a huge lag time between the problem occurrence and its resolution. Managed IT Services and remote tech support, our approach continuously monitors a client network for problems using advanced monitoring tools. The IT Support team is immediately and automatically notified when a problem occurs, and can act fast to resolve it, most times even before end-users are impacted. Call us at 416 918 0094 or fill out the form for a quote and let us be your Managed IT Services partner!